Xeikon, a division of Punch Graphix, and Italy-based MOSS, a leader in container decorating technologies are showcasing new applications for its jointly developed digital heat transfer Digital Decorating System at K-Messe. The exhibition is being staged in Dusseldorf from October 27 to November 3. Xeikon and MOSS can be found at Hall 04 / E21. The Digital Decorating System is ideal for label printers and injection molders. It is a high-quality, flexible and cost-effective alternative to direct screen or direct offset print for short-to-medium runs. The solution requires no set-up or plate costs. It also delivers much higher quality compared with direct print technology, in terms of both image quality (1200 dpi) and a more opaque white. The first stage in the easy two-step process is Xeikon’s web press, which prints the exact number of transfers required for the decoration. Using the Xeikon press enables self-adhesive and heat-transfer labels to be printed. 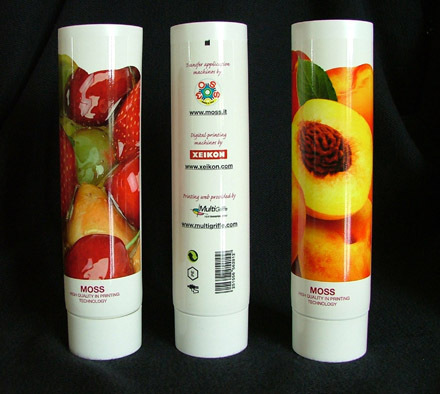 In the next step, the roll of printed transfers is fed into the MOSS Digital Decorating System, which perfectly applies transfers to seamless tubes via the heat transfer process. The result is a high-quality, digitally printed and applied decoration that is scratch and water resistant. Moss manufactures and sells silk-screen, offset and hot-stamping machines for the decoration of articles and containers. In addition to its vast range of machines from simple 1-colour semi-automatic machines to fully automatic 8-colour lines with computerized controls, also produces a complete range of complementary equipment, not to mention the sale and installation of labeling machines on its own printing lines, and is in a unique position to be able to offer, not only first class after sales customer service, but also a truly complete service to its customers in terms of art-work, plate and screen manufacturing and technology and inks and varnishes. A pioneer in digital printing, Xeikon designs, develops and delivers high-end digital colour printing systems for the industrial, document and commercial printing market segments. 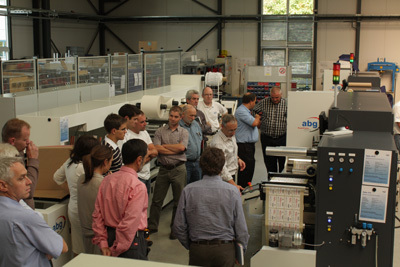 Pharmaceutical labels set centre stage at the recent open house held by AB Graphic International Gmbh at Baesweiler, Germany. The company set the theme of the event with targeted emphasis on companies wanting to break into the pharmaceutical label market or optimise existing production quality. The event also demonstrated how medium run Braille labels and booklets can be produced efficiently and cost effectively. The three day open house was a great success with over 150 visitors from all over Europe and was supported by our Distributors and personnel from our facilities in Germany, France, Spain, Holland and the UK," said Matthew Burton of AB Graphic International. "We demonstrated a variety of converting machines running various pharmaceutical jobs equipped with FleyeVision 100% print face inspection.These included our F150 entry level pharmaceutical and security print inspection machine and an F2010 multi lane inspection system with ink jet marking capability. Demonstrations were complemented by a stand-alone Braille printer, a booklet insertion machine, and an offline PDF comparison unit that sends printed material to the rewinder." A long established manufacturer of label converting systems, AB Graphic International operates on a world-wide basis from its UK headquarters in Bridlington, East Yorkshire. The company is well placed to provide full sales and support globally through a network of established distributors and its facilities in the USA, France, Germany, Spain, and The Netherlands. The first South China Label Show has just closed its doors in Guangzhou on one of the most promising label events that the region has seen, leaving the industry looking forward to the next edition. The three day show boasted 90 exhibitors, 16 working presses and a large number of other machinery units. Xeikon displayed their new 3500 Digital press for the first time in China at the event. A strong and comprehensive 12 session conference program complemented the show. The keynote presentation delivered by Roger Pellow, Managing Director of the Labels Group and Ilkka Ylipoti, VP Asia Pacific of UPM Raflatac looked in detail at the global trends and opportunities in the industry and the current position of the Chinese printing market. Of the 4,021 visitors the majority came from China followed by India, Malaysia and the general Asia Pacific region. There was also a large Japanese delegation led by Label Shimbun. Following the success of the show, the Labelexpo Global Series group has announced that they will be returning to Guangzhou in 2012. 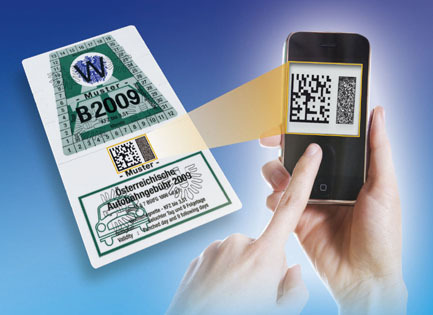 Schreiner ProSecure now offers another solution which reliably indicates tampering with PIN mailers: the PIN VoidMultiColor-Label. The multi-colored edge of the label makes it nearly impossible to detach it and to read the secret data without the recipient noticing the tampering attempt. Criminal attempts to gain access to bank or credit card accounts are continually increasing. To effectively thwart undetected PIN spying on confidential mailers, Schreiner ProSecure has extended its portfolio of security features for labels by a multi-colored edge in a PIN protection label: the PIN Void MultiColor-Label that comes with a void effect which is activated when the label is peeled off the substrate for the first time. The void effect consists of text or a pattern which is preserved even if the label is accurately re-positioned on the mailer to seal the PIN again. The multi-colored design of the label’s edge featuring luminous colors and color gradients makes it nearly impossible to conceal the void message or image again by re-coloring it. As additional security elements, the label has integrated cuttings which destroy it during a peel-off attempt, and a scratch-off hologram. The PIN Void MultiColor-Label can be customized in terms of size and visual design. It is suitable for use on all standard stationery and thus assures easy and low-cost processing. Xeikon, a division of Punch Graphix, has been a pioneer in digital color printing and dry toner technology since its inception more than 20 years ago. With the launch of the Xeikon 3500 digital label production press and QA-I toner at IPEX 2010, the company has taken the suitability of its technology for food packaging applications to an entirely new level. In the United States, Food and Drug Administration (FDA) sets guidelines that must be followed with regard to food, whether packaged or not. Some of these guidelines are with respect to the actual materials being used to produce the labels, such as inks, toners and substrates. In addition, FDA also sets guidelines with respect to the printed materials in contact with food. The two types of food contact are direct and indirect. With direct food contact, the printed material comes into contact with the food. Indirect food contact refers to printed materials that are located on the outside packaging of the food. The Xeikon QA-I toner meets all the applicable FDA guidelines for indirect food contact under room temperature and less severe conditions as well as direct food contact for dry food substances containing no surface oil or fat under the same conditions. Food safety is of the highest priority for label converters, as nearly 40 percent of the digitally produced labels are used for food packaging applications. By utilizing Xeikon's latest technology, label converters can gain a unique competitive edge in the markets they serve. Other printing technologies that involve UV-inks or solvent-based liquid inks do not always meet the FDA guidelines as they contain low molecular weight components. 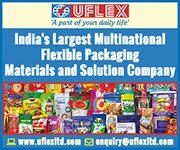 For example, most UV-inks are unsuitable for indirect food contact as non-cross linked molecules or photo initiators present in the cured ink could migrate through the packaging and contaminate the food being packaged. According to Michael V. Ring, president of Xeikon North America, "Label converters involved in food packaging applications operate in a challenging and complex world. Governmental safety regulations have considerably increased the amount of information that needs to be included on a label. As a result, label converters have to judiciously utilize the available space to produce something that not only meets all the regulations, but is also eye-catching and compelling to capture a consumer's attention. At the same time, they have to keep an eye on their costs. Xeikon's QA-I toner supports all of these goals by offering superior image quality at 1200 dpi and unique advantages in food safety." 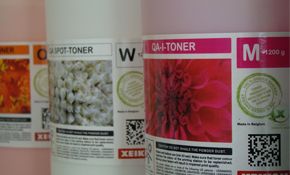 The QA-I toner is produced at the company's dedicated toner production plant in Heultje, Belgium. It has been developed specifically for Xeikon's family of digital label presses, which includes the Xeikon 3500, 3300, and 3000. The QA-I toner suitability for indirect food contact applies to all process colors (CMYK) as well as spot colors (white, clear, extra magenta, red, green, blue and orange). The toner's direct food contact suitability applies to all process colors (CMYK) and white, clear and extra magenta spot colors. A pioneer in digital printing, Xeikon designs, develops and delivers high-end digital colour printing systems for the industrial, document and commercial printing market segments. These systems are composed of advanced web-fed printing engines using LED-array-based, dry toner electrophotography, open workflow software, exclusive toner and other consumables. The self-adhesive label, tape, medical/ hygiene, and graphics industries are characterised by an extremely complex value chain. They are currently challenged by raw material price inflation, a highly-competitive business environment, and sustainability issues. The 2010 Self-adhesive Technology & Market Conference, organised by AWA Conferences & Events, represents an opportunity for industry participants at all levels - production, R & D and technical management, marketing, product management, converting -- to look at the ‘big picture’. The conference agenda will identify areas for future innovation; discuss threats and challenges to existing business; highlight new end-use markets; and evaluate advances in product and process technology. The Pressure-sensitive/Self-adhesive Technology workshop is designed to introduce participants to the basics of self-adhesive products, including their design, manufacture and end-use. The target audiences are professionals involved with marketing, research, technical support, quality control and production that may be new to the self-adhesive industry as well as those professionals needing a primer on the technical aspects of self-adhesive products. To support understanding of the market and the technical background for self-adhesives, a broad range of topics from market trends to “why self-adhesives work” will be covered. The conference – in Amsterdam, 18-19 November 2010 - features expert speakers from across the value chain. The opening session will provide an overview of the global self-adhesive label and graphic arts markets, and trends in materials, end-use markets, and testing. A full session addressing regulatory and environmental matters - including options for web waste in self-adhesive label converting, adhesive recyclability, solvents, and REACH – completes the formal program for the first day. The second day opens with an evaluation of materials development, including adhesives for pack reclosures and hotmelts. In-depth papers on process and equipment developments such as coating and drying technology, machinery for coating labelstock and tapes; and slide die-coating complete the formal program. Networking opportunities during breaks and around the accompanying tabletop exhibition are extensive; and conference sponsors UPM are hosting a cocktail reception at the end of the first day. Full details of the Self-adhesive Technology & Market Conference 2010, Dutch Design Hotel Artemis, Amsterdam, The Netherlands, 18-19 November 2010, are available via the AWA website,www.awa-bv.com, where it is also possible to register online. 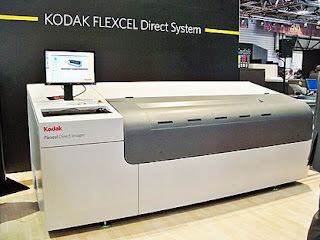 At the Packaging Innovations Show that took place at the Business Design Centre in Islington, London on 7th and 8th October, Kodak demonstrated its Kodak Flexcel NX Digital Flexographic System technology which offers customers the ability to develop business through innovation. 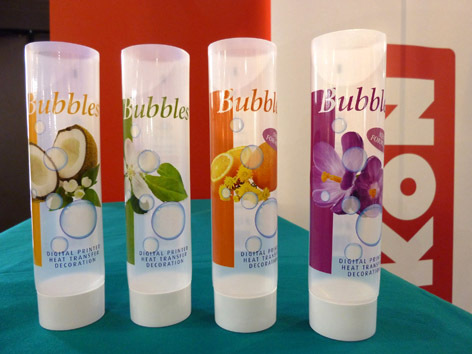 Reproflex 3 Ltd, a Kodak customer, and National Flexibles who also have stands are demonstrating creative samples of flexible packaging printed with the Flexcel NX System. “Kodak is confirming its commitment to the packaging print sector," says Jonathan Moore, Kodak Packaging Sales Director for the UK and Nordic regions. “We are delighted to attend the Packaging Innovations Show and join our customer Reproflex 3 and its printer National Flexibles. All three stands demonstrated samples of the quality and innovation of the Kodak Flexcel NX System technology." Kodak recently won a 2010 InterTech Technology Award from the Printing Industries of America - the highest honour for innovation in the graphic communications industry for Kodak Digicap NX Screening which is used with the Kodak Flexcel NX Digital Flexographic System to improve ink transfer efficiency during flexographic printing, especially when printing on films. The Flexcel NX System achieves levels of print quality that you would normally expect from gravure, offset or digital printing. The Flexcel NX System drives significant cost savings on press with high resolution. The flat-top dots deliver wide impression latitude, fast set-ups and long plate life. As a result users find that make-ready wastage costs can decline by 25% and their plates are capable of run lengths two or four times greater than traditional digital plates. The Kodak Flexcel NX System is a flexographic system that enables true one-to-one reproduction of the image from file to plate. Kodak SquareSpot Imaging Technology, the Thermal Imaging Layer (TIL) and the process of exposure in the absence of oxygen mean that the image in the digital file is faithfully reproduced pixel for pixel, bringing total predictability to the process. The Kodak Flexcel NX Imagers use SquareSpot Imaging Technology, giving an effective resolution of 10,000dpi to enable printing dots as small as 10 microns. This allows subtle highlights details, vignettes and fade to zero and the use of all available grey levels. Because of the one-to-one reproduction and the flat-top dots none of the detail is lost from beginning to end of the print run. Effective ink transfer has a tremendous impact on both visual appearance and print production efficiency. The Kodak Flexcel NX Digital Flexographic Plates, with their flat-top dot structure and resistance to impression, enable higher print densities and smoother solids. In those print applications where ink transfer is a problem, a significant boost can be achieved through the use of Kodak Digicap NX Screening, which applies a micro fine surface texturization pattern to the printing surface of the Flexcel NX Plate. Europe Match GmbH, Europe’s largest producer of advertising matches, recently selected EskoArtwork’s ArtiosCAD packaging software and Kongsberg XE10 cutting table to speed up production of its product samples. Combining the world’s most popular structural design software with the best-in-class cutting table, Europe Match now produces high quality samples, which are 100% identical to the final product, within hours. The EskoArtwork technology, renowned in the market for its accuracy and precision, is also used during the pre-production phase to create files for plate layouts and die tooling. The EskoArtwork solution is not only a powerful marketing tool for Europe Match; it also plays an important role in optimizing the production process. “Once the order is taken we then proceed to set up for mass production,” continues Mr. Nagy . “We use the layout and tooling features in ArtiosCAD to create plate layouts and die-tooling. The Intelligent Layout module automatically works out the optimum layouts for lowest cost - ensuring the most efficient use of raw material. With the DieMaker module we can quickly create quality die boards and coating blankets from a sheet layout for both flat and rotary dies,” adds Mr. Nagy . 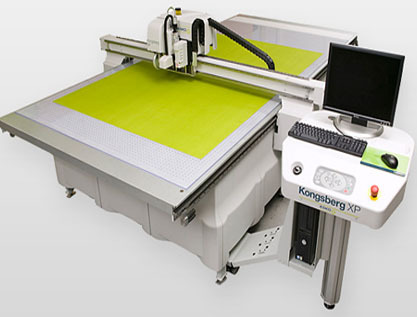 The Kongsberg XE10 is a small-format dieless digital table for cutting and creasing folding carton boxes. Featuring a servo system with accelerations up to 1.2G, resolution of 0.005mm and repeatability of 20µm, the table operates at lightning speed while maintaining perfect precision. With a work area of 800mm x 1100mm (31.5″ x 43.3″), the Kongsberg XE10 can accept material as large as 900mm x 1200mm (35.4″ x 47.2″). The table comes with a range of expandable tooling options including a pressure controlled, high-precision kiss-cutting knife tool, reciprocating knife tool for corrugated and foam board, static knife tool for solid materials and a crease tool for packaging materials. The Kongsberg XE10 can process a wide range of packaging materials including folding carton, single flute corrugated board and synthetic materials such as polypropylene. EskoArtwork’s ArtiosCAD is recognized as the world’s most popular CAD software for packaging. Designed specifically for packaging professionals, ArtiosCAD delivers a true end-to-end packaging design workflow with full integration between structural design, graphic design and packaging production. The “round trip” design connectivity with Adobe Illustrator enhances productivity and communication between structural and graphic designers. Complete 3D integration within ArtiosCAD enables quick prototyping of designs and reduces design review time cycles considerably. The same structural design assets produced in ArtiosCAD can also be used to create files for die-tooling and step-and-repeat layouts for printing. Automated ink logistics are an essential component of a cost-conscious, sustainable printing operation that meets the global brand-owners' demands for quality consistency and responsiveness. This is especially the case when complex spot colours are required for a unique brand identity. GSE Dispensing's gravimetric, automated ink dispensing solutions empower printers to prepare the precise colour quality, to the exact volume requirements, on demand. "Our technology offers numerous benefits besides equipping printers to meet the global brand owners' demands for total colour consistency," explains GSE's senior sales manager Johan Kerseboom, who is set to speak on the topic of ink logistics at the Asian Flexographic Technical Association's flexible packaging and labelling conference in Jakarta, Indonesia, November 18 - 19. "It removes the risk of printing rejects during production, reduces ink waste, and minimises the chance of press down-time as workflow bottle necks at ink-mixing stage are avoided. Furthermore, procurement costs can be reduced by as much as 25 percent because the need to outsource ink mixing operations to external sources is eliminated." At the AFTA event's exhibition, GSE Dispensing will present its range of options under its Smart (th)inking theme. The Dutch company offers a wide range of modular gravimetric ink and paste dispensing systems, tailored to the individual needs of the graphics and textile printer. The Colorsat Match dispenser is ideal for label printing applications, enables clean, fast and waste-free recipe preparation in batches of 1 to 5 kg. Others in the range include the Slim and Compact systems that handle larger volume requirements required in flexible packaging or board printing situations. Typically, volume requirements for the most challenging recipes are dispensed to an accuracy of one gram. Dispensing time takes between two and four minutes, depending on the system. Excess ink from a print run is easily reused, located and retrieved from stock, for easy reuse in future jobs. Some customers have boosted ink yields by as much as 30 percent, thanks to GSE Dispensing's technology. A high-powered software platform, IMSTM, whose time-saving features include management tools such as stock control, ink consumption analysis, recasting and traceability of ink ingredients by batch, as required in pharmaceutical and food packaging applications. GSE Dispensing has a network of local distributors, such as Techno Global Graphics in South East Asia and International Caliber in India, who can provide expert technical support at short notice, in the local language. Also, remote diagnostics, to proactively resolve any issues with dispensing system software via internet, are provided around the clock from the GSE headquarters. Since it was founded in 1974, the company has achieved over 1400 installations world-wide. Prati Automation, recently established to manage the sales & services operations of the PRATI machines in the label and converting industry in US and Canada, made its public debut at Labelexpo Americas 2010. At the show, Chiara Prati, Worldwide Sales Manager at PRATI, and Glen Morris, Managing Partner at Prati Automation introduced Bryan Ivens as Sales Manager for the North American market. Brian Ivens is well know in the North American labelling market and he has already been successful in selling his first Prati machine, a Jupiter TC330, to a label printer in Canada. PRATI supplies machines for self-adhesive label print-finishing: covering customisation, inspection, die-cutting, matrix waste removal, rewinding, slitting and overprinting. The company’s product range incorporates versatile-use solutions which contribute to increased productivity at a low cost. 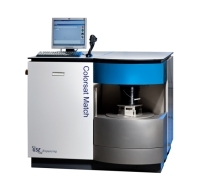 These include the Jupiter and Saturn inspection tables, the modular and customer-specifically adjustable VegaPlus platforms, the PharmaCheck finishing system, which is tailored specially to the needs of the pharmaceutical industry, and Uranus for overprinting and verifying data. Xeikon, a division of Punch Graphix is using the Labelexpo South China show platform for the first demonstration of Xeikon’s new flagship digital label press, the Xeikon 3500, in this important Asia Pacific market. Xeikon is exhibiting on stand A2. 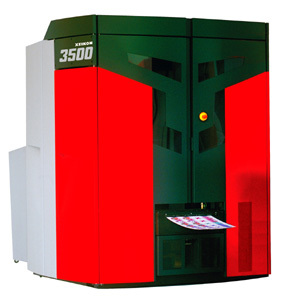 The Xeikon 3500 digital label press was launched in May 2010, and is set to have a significant impact on the breakeven point between digital label printing and conventional print technologies. Capable of printing up to 516 mm wide at a speed of 19,2 m/min in up to 5 colors, the system is almost twice as productive as the closest competitor product. The Xeikon 3500 digital press can print on an unmatched range of substrates, including self-adhesive paper, co-extruded films, Bopp and PET, regular papers, transparent and opaque foils, and paperboards with weights ranging from 40 to 350 gsm. It uses Xeikon’s QA-I toner, which meets all the applicable FDA guidelines for indirect food contact as well as direct food contact. At the show, the Xeikon 3500 is printing on self-adhesive materials from Avery Denison, Manter and Raflatac, to produce a range of applications such as pharmaceutical labels, food labels and high quality wine labels. The event’s conference program will also feature Xeikon’s Hans Gerinckx presentation on the subject of digital printing, in combination with EskoArtwork. In the past 15 years there has been a continuing growth of digital printing technologies with now over 30 digital label press suppliers in the market, representing some 40 different models. With more than 1,300 digital label presses already installed, digital label printing is now regarded as a mainstream label printing technology. It is accepted by thousands of end-user customers in all kinds of applications and in a wide range of run lengths. Over many years, printability testing equipment, procedures and standards for conventional printing by offset, letterpress, flexo or gravure have become widely used and/or accepted by the paper and board, printing, converting and print end-user sectors. However, most of the standard printability tests and procedures have yet to be fully tried, modified or utilized - or new tests developed, for the digital printing of labels and packaging. So, although the digital market matured significantly over the past decade, there remains a major leap to being taken. For that purpose and upon the initiative taken by IGT Testing Systems and label guru Mike Fairley, a task force representing different disciplines has now been established. This technical digital label printability group is now to explore the possibilities of setting up a common testing framework facilitated under the Finat umbrella. The overall aim is to make digital label printing a more globally standardized technology in terms of printability, performance standards, test methods and procedures. There are a number of challenges currently identified and determined. There is a need for defining and agreeing on digital technologies and terminology. It is desirable to benchmark digital label printing processes against each other and against conventional printing on existing test equipment. In addition, standards and procedures for testing digital label printing need to be written and dedicated or new test methods developed where required. Finat, founded in Paris in 1958 and headquartered in The Hague (The Netherlands), is the world-wide association for manufacturers of self-adhesive labels and related products and services. 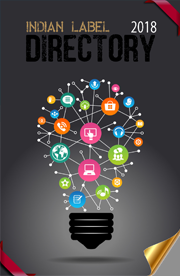 With 600 members in over 50 countries around the world, Finat has much to offer to label converters and all suppliers to the labeling industry in terms of information exchange and the opportunity to network internationally. Yupo, the largest manufacturer of synthetic papers in the Western Hemisphere, has introduced a new security product for the label market: YUPO Security Grade. As the world’s leading IML substrate provider, Yupo’s tamper evident label substrate can help brand managers and product developers gain advantage over competitors in the marketplace. Hewitt described Yupo Security Grade as an example of the company’s commitment to developing new YUPO grades to meet the needs of new applications. "This year, tamper-evident labeling is emerging as an important segment in the label market and is used in many ways to avoid counterfeit products and protect shipments of value added goods," he added. UK manufacturer Meech International is using K 2010 as the venue for the worldwide launch of the 994 IML high voltage generator. The new generator works in conjunction with the recently introduced Meech Hydra, a miniaturised in-mould labelling pinning system specifically designed for use in situations where small items are being moulded. The 994 Hyrda system overcomes many of the issues encountered with other commonly used in-mould labelling technologies and because of this the purchase and running costs are reduced significantly. “Meech has been involved in static control technology for decades and we’ve called upon that experience to develop a product that meets the requirements of OEMs and end users, many of whom are unhappy with the in-mould labelling options currently available on the market when dealing with smaller containers and labels,” says international product manager David Rogers. The standard 994 Hydra system consists of resistively coupled distributors connected in parallel to the new 994 IML generator. The distributors provide independent, spark-free, operation of the pinning heads and have a mounting footprint of only 50 x 86 mm. The pinning heads are only 15 mm long x 5 mm diameter, making installation possible on the smallest label carriers. To assist customers, Meech can supply recommendations for pin positions. Customers can specify individual cable lengths for bespoke systems or can finish the cables to the correct length themselves, making them ideal for OEMs. Tarsus newest show in the south of China - The South China Label Show that starts tomorrow is the region’s only event this year for you to see the latest printing and packaging technology in action. More than a 100 exhibitors showcasing the latest machinery and materials will be present with the latest technology and updates. Everything is there - from multi-substrate presses to digital presses, laser die cutting to RFID and intelligent labels, in-line decoration systems to multi-process ink systems, VIP substrates to high technology label films, sleeves and wraps. 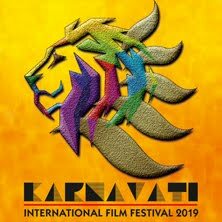 Taking place tomorrow morning, just before the show opens, the Opening Ceremony will be held in a specially built conference theatre on the show floor. The contemporary ceremony has been designed to reflect the rapidly advancing nature of the market in South China and there will be introductions from global experts who are key industry figures. This is one opening ceremony that shouldn't be missed. Also, a range of conference sessions are also organized in tune with the demand as this show gives you an opportunity to learn from top experts in 12 FREE in-depth conference sessions, including a keynote presentation from Ilkka Ylipoti, Senior Vice President Asia Pacific, UPM Raflatac, on the first day of the show. Whether you are looking to meet leading suppliers, brand owners or converters or just to share information and set up partnerships to put you ahead of your competitors, the South China Label Show is the place to get the tools and techniques to grow your business. US-based label giant Multi-Color Corporation (MCC) will establishing label operations in China. Having received Chinese Government approvals, a new MCC facility will be located in Guangzhou, near many national and international consumer products brand owners. MCC claims it is bringing modern label technology and know-how to support the rapidly growing consumer demand for high quality packaged products in China. The new business will be run by MCC's Asia Pacific president of consumer products, Brenton Barrett. He will lead a largely local team with specific expatriate support. MCC is one of the world's largest label printers with annual revenues over US$300m and with operations on four continents. Specializing in the home & personal care, food & beverage and wine & spirit markets, MCC is the only global U.S. publicly listed label company and specializes in the highly fragmented multi-billion dollar label industry. With just over a week to go until the South China Label Show, which kicks of October 25 at the Guangzhou Jinhan Exhibition Centre, organisers have released the conference programme, which will cover many new and debatable issues. Tarsus, the organizers of this new label show in South China say the programme consists of carefully selected speakers, including brand owners, environmental experts, key suppliers and illustrated customer case studies. Digital label printing: State of the art and digital solutions - this session will give a comprehensive explanation of the digital technologies: inkjet, liquid and dry toner. It will also look at how to integrate digital and conventional technologies and how to use digital technology to enhance a brand. Environmental solutions for the label industry in China: Some of the questions that will be answered in this session include: ‘What is the environmental strategy of the Chinese government in areas such as carbon emissions?’, ‘Liner and matrix waste recycling – an important issue in China?’, and ‘What are the main environmental standards recognized by the Chinese government and by end users in China?’. Anti counterfeiting solutions and security: This session will look at measuring the scale of counterfeiting in China, protecting inkjet systems, security inks (including: photochromic ink and UV fluorescent inks) and a case study to demonstrate combating pharmaceutical counterfeiting. Brand owners/converters: The session will explore what Chinese brand owners are looking for from printers, what the opportunities are for brands using digital printing, give an analysis on brand protection and counterfeiting in China and what the solutions are, and also look at smart label solutions – can printers make profits from RFID and smart label technology? Mimaki Engineering Co Ltd has announced the release of the new JFX-1631plus and JFX-1615plus UV LED curing large format printers. This series is 80% faster than its existing model JFX-1631 due to a newly implemented post-curing unit. In addition, JFX plus series can be optionally equipped with a roll unit for uninterrupted web printing. Existing JFX-1631 UV LED large format printers can be upgraded to JFX plus series by installing the optional post-curing and/or roll unit. The new JFX-1631plus and JFX-1615plus UV LED curing large format printers now achieves a maximum print speed of 23.6m²/h (300 x 600dpi / 4pass / bidirectional), an 80% increase in speed on the current JFX-1631 model. This is achieved through the new standard installation of a post-curing unit, whereby the ink gets a secondary curing after the UV curing. An optional automatic roll unit for unattended and uninterrupted web printing can be obtained for the JFX plus series. Short-run print orders of the same or different jobs with the print size limited to the maximum print area on the flatbed are efficiently processed and printed, significantly improving productivity. In addition, continuous printing can be done unattended overnight if there is a large quantity order, resulting in fast turnarounds and an increase in productivity. JFX plus series will be introduced in two different sizes: JFX-1615plus featuring a maximum print size of 1,602 x 1,500mm and JFX-1631plus with a maximum print size of 1,602 x 3,100mm. This enables print service providers to choose their equipment according to their required job sizes as well as their individual environmental requirements. The high image quality means far fewer banding artifacts and the possibility to print legible 3 pt letters. UV LED curing enables printing on heat sensitive substrates as its curing diodes do not generate excessive heat thus eliminating media deformation or colour changes. Direct UV printing can be performed on non-coated substrates up to 50 mm thickness. Clear ink (available only in hard UV curable ink) provides glossy finish or matte finish adding value to the product outcome, while white ink makes vivid full colour print possible on transparent or coloured substrates. All inks can be applied with different layer printing enabling dimensional printing with outstanding haptic effects. The soaring growth of national economy, rapid development of various industries, enterprises’ increasing demands on packaging quality standard and technical innovations in China have brought huge opportunities to the self-adhesive label market. At present, growth rate of global demand on label is 3-6%. Due to the boost in national economy, China is seen as the consumer market with the largest potential in label industry development in the world. According to the current statistics label consumption per-capita in China is only 10% of that in European and American market, indicating a strong vitality and development potential of the future label market in China. Nowadays, labels are widely applied in various industries, in which the development of self-adhesive labels in different industries is outstanding with its unique advantages and innovative techniques. Self-adhesive label industry is predicted to undergo a dramatic development on five major industries in China, which include daily chemicals, pharmaceuticals, electronics, food & beverage and tire & lubricant industry. Statistics shows that Guangdong Province not only occupies almost 70% of daily chemical production in China, but is also recognized as the major manufacturer and exporter of food & beverage industry of China, where beverage, bakery products, health-care products and condiments have been sustaining a leading position in the international market; comprising Shenzhen, Guangzhou, Dongguan, Huizhou, Foshan and Zhongshan, electronics industry has taken shape as one of the pillar industries in Guangdong as well as a famous electronics information industry hallway; In 2009, biopharmaceutical industry in Guangdong achieved a splendid production growth with a of 48% on biological product upon the previous year, exports value has increased by more than seven times whereas pharmaceutical industry has grown by 18.3% on its production, ranking the third nationwide position. Rapid development on label application in different markets has brought to the label industry in Guangdong a bright prospect, driven a huge demand on advanced label materials and printing equipment by enterprises of both label and package printing industries in South China. Jointly organized by China Foreign Trade Centre (Group) and Hong Kong Adsale Exhibition Services Ltd, “The China International Exhibition on Label Printing Technology” (namely Sino-Label 2011) is the earliest and only large-scale label printing exhibition in South China that specializes purely on label printing technology. , which was held just right to present state-of-art domestic and foreign technology on label printing, rotary printing, and label printing materials & equipment for the enormous label market. Sino-Label 2011 will be grandly held at the China Import & Export Fair Pazhou Complex (Area A) in Guangzhou on March 9-11, 2011. 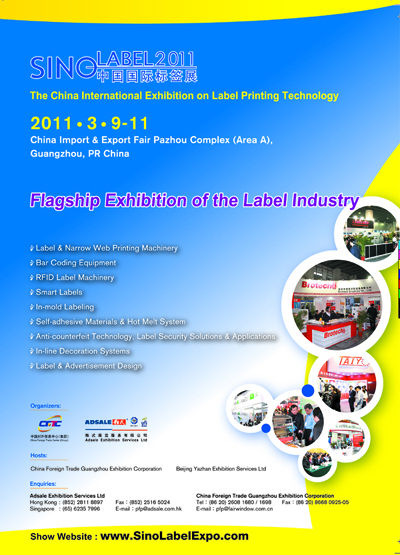 Exhibitor recruitment of Sino-Label 2011 is approaching the epilogue. Renowned suppliers including Taiyo, Lintec (Japan), Labelmen (Taiwan), ETI, Nuova GIDUE, Avery Dennison, UPM, Dowell, Haotian, ZhongTian, Taihang, Wangjie, Nickel, WeiGang, Wan Hong, Brotech, Zhong Tian Hongda, Hexiang, Label Long, H.Shine, Mitsa, Xinhao Adhesive, ZhongShan Fuzhou, Moma, Colamark, BST, LECCO, Soontomax, Rotary, Unilux and so on, have enthusiastically confirmed their participations. Most of them have been supporting Sino-Label for many years and are deeply impressed with effect of the exhibition and professionalism of the organizer. 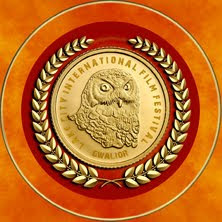 The Sino-Label 2011 will gather 200 local & overseas exhibitors. Together with the concurrent exhibition - The 18th Printing South China, number of exhibitors is expected to reach a breakthrough of over 900 in total. In order to motivate development of label industry in China, the organizer endeavors to extend its promotion coverage to the whole label, printing & packaging industry through buyer services enhancement, which include inviting professional media and associations, bringing quality suppliers to the buyers, as well as organizing high-end forums on the latest industry topics. Sino-Label strives to be the flagship of the label industry in South China and even the whole China. The previous Sino-Label in 2010 received enthusiastic responses from visitors and trade media, over 60 local & overseas associations and official organizations came to visit and purchase, more than 100 media have given a detailed report and positive praises for the exhibition. Famous printing enterprises include Guangzhou Fungchoi, Jinjia Color Printing, Nine Stars, Toppan Printing, Shenzhen Yaqi, Dongguan Yifeng, China Publishing Group, Zhifeng and Prosperous Group, etc have come to visit and purchase at the show. Just as always, Sino-Label 2011 will forge the most powerful strategic combination with associations, media and official organization, to further expand coverage and strengthen publicity work, at the same time invite strong buyers with purchase intention. 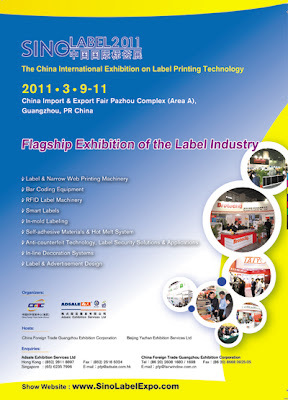 Sino-Label 2011 is foreseen to be shaped as the leading trading platform of label industry in China. The organizer of Sino-Label 2011 have put great effort to invite and cooperate with a number of printing and packaging associations and enterprises from different cities & provinces in China, including Guangdong Anti-counterfeit Association, Shenzhen Anti-counterfeit Association, Committee of Guangzhou Packaging & Printing Association, Fujian Provincial Packaging Decorating Printing Association, Rotogravure Division of The Printing Technology Association of China, Shantou Jinping Printing Chamber of Commerce, as well as provincial printing industry associations in Beihai, Guangdong Heshan, Guangdong Jiangmen, Guangxi Nanning, Guangdong Shaoguan, Hebei Hengshui, Jiangxi, Quanzhou, Shenzhen, Xiamen, Yulin, Zhaoqing; and packaging & printing associations in Foshan Nanhai, Guangzhou, Shunde, Zhongshan and so on. As an UFI approved event on international printing & packaging industry, the 4 shows aggregate for an extensive showcase that covers the whole industry chain of label, printing, publishing and packaging altogether. For enquiries, please contact (Local) Ms. Sally Ou Yang at tel: 86-755-88265635; (Overseas) Ms. Celine To at tel. : 852-25163371, fax: 852-516 5024, or email at: pfp@adsale.com.hk. In alternative, please visit the show website at: www.SinoLabelExpo.com.